Tomorrow is Greek Orthodox Easter. 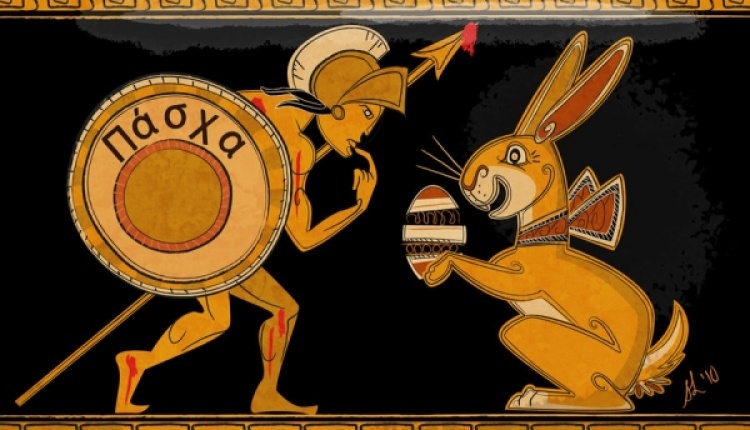 The simple answer for the difference in the date used by Greeks and others of the Eastern Orthodox faith from that followed by Protestants and Catholics is that the former calculate their Easter based upon the Julian calendar while the latter use the modern Gregorian calendar. If you want to know precisely how the date is determined, check out this link to my post a few years back around this time. 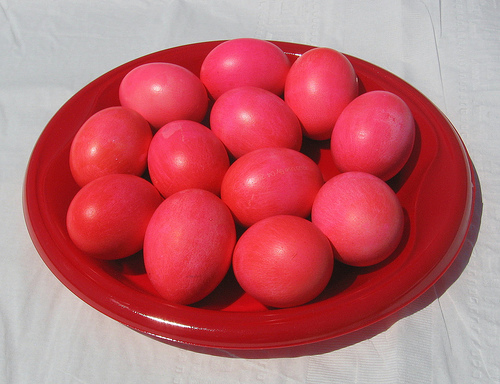 But no matter how the date is determined, Easter is by far the main event in Eastern Orthodoxy. It is preceded by more than a week of significant religious and cultural observations. 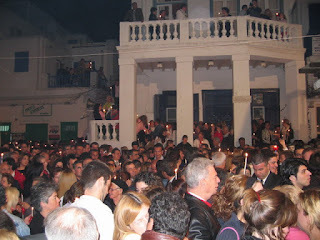 And on Mykonos, Easter literally brings the island back to life. 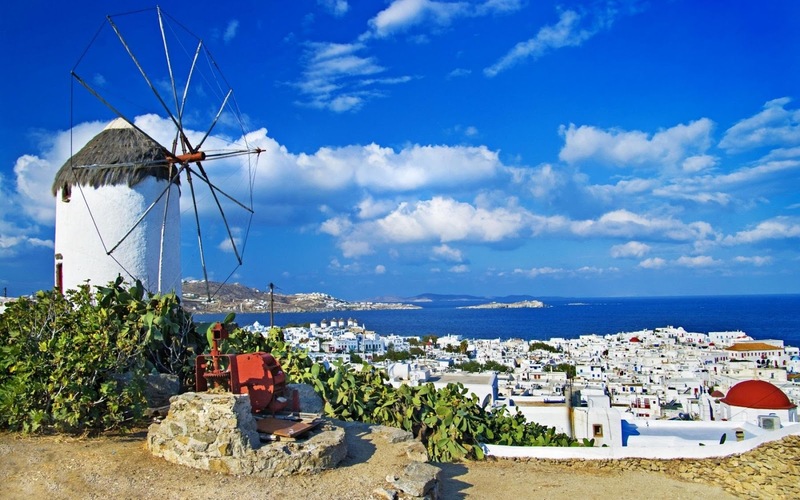 In the winter, Mykonos is a sleepy island village with virtually no tourists, no business, few open bars, fewer restaurants, and no clubs. But come Easter Week everything changes. 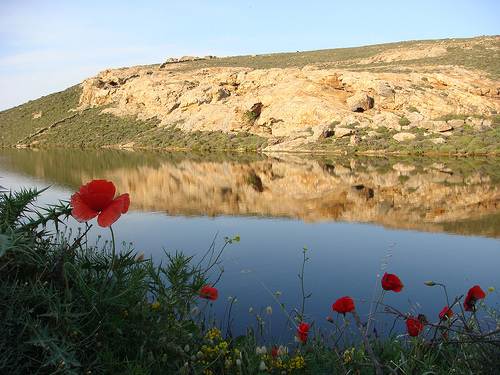 Red and yellow springtime poppies burst to life all over the island’s hillsides, and those and still more varieties of flowers embroider the blanket of green covering the nearby holy island of Delos. 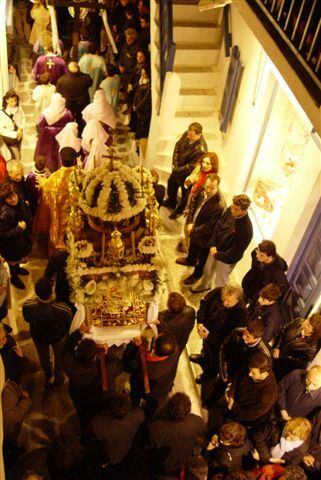 There are Church services every day of Holy Week, as well as daily preparations for the feast to come at the end. 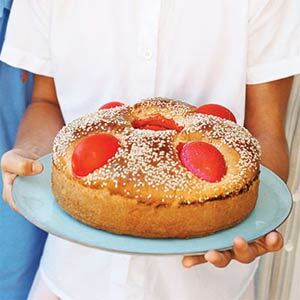 Breads and cookies are readied on Monday and Tuesday, baking is done on Wednesday, and eggs are dyed red on Thursday, the day before Christ was put up on the Cross. Evening services on Good Friday start at seven in the old town’s three main churches, Kiriake, Metropolis, and Panachra. 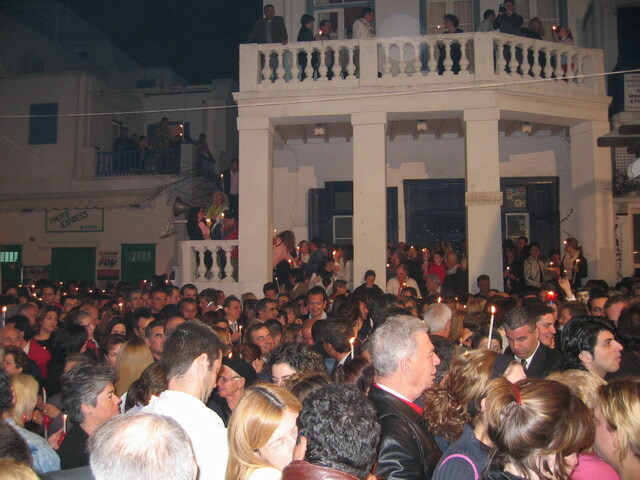 At precisely nine, each church’s clergy and worshipers leave their church in separate processions carrying their church’s epitaphios (the painted or embroidered cloth representation of Christ on a bier elaborately adorned in spring flowers and symbolizing his tomb) along a prearranged route, winding past the other two churches before ending up back at their own to complete the service. It represents the funeral of Christ, and Mykonians and visitors line the route, some standing on balconies and sprinkling the participants below with a mixture of rose water and perfumes, the rodhonoro used on Christ’s body when taken down from the cross. Don't worry, EvKa, the lamb no longer misses them. Agree with above comment. If it wasn't for the religious part, would sound great, and also the lam in the soup. My question is about how people "fast" for 40 days. People would get seriously sick if they do that. Do you meant Lent where people give up something they enjoy? I'm not up on religious rites. What do non-religious people do there or people of other religions? I guess just enjoy the food. My friend Gary--writing as Diffraction--gave a perfect explanation in his comment to your and Evka's questions. The thing to bear in mind is that Greece up until relatively recently has been virtually homogeneous in its religion and, as such, has many of its practices ingrained in as part of the Greek culture even for those who are not particularly religious. As for the fasting, it's not the same as a fast for observant Jews where all food is avoided, but--as Gary points out, selective. The 40 day long Lent is a spiritually preparatory period for the forthcoming religious events. People are expected to fast as a token of compassion for the passion of Christ. 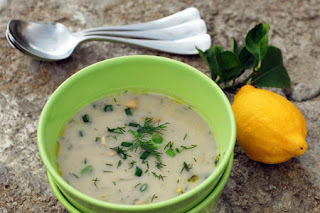 However, this fasting is not exclusive of all food (as it is e.g. in Islam during Ramadan). Greek Orthodox fasting basically means abstaining from certain kinds of foods, basically meat and dairy products. Even so, it is not usually observed throughout the whole 40 day period, but rather during the Holly Week. So it's perfectly healthy and safe. As for your second question, well, there are virtually no non-Christian Orthodox people in Mykonos and in Greece in general. Christian Orthodox amount to 98% of the population. Not all of them embrace the religious events with the same spiritual warmth however, but in the countryside the physical and spiritual participation is way more universal, almost dominating daily life. Hope this helps. Gary Parisis. Thank you, my friend, for a perfect explanation! And here I thought all you knew was how to fearlessly fly aircraft! :) Καλο Πασχα, and hope to see you soon. What a wonderful post, and an even more wonderful tradition. I've participated in midnight Easter Vigil services here in the States (based in part on the ancient rituals that gave birth to the Greek Orthodox traditions) and they're very special -- quite different from most people's understanding of "church." 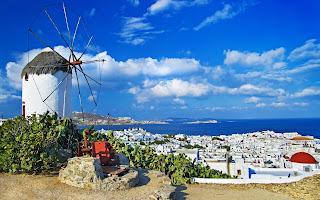 I love learning about traditions in other lands, thanks for the great window to Mykonos, Jeff! Thanks, Susan, but when it comes to learning of traditions in other lands, you're the one to whom I turn! So are they basically vegan during this period of time? Lovely post. Thanks, and I'd definitely call it closer to vegan than the normal, red-meat-glorified menu. What do they do? Just join in the festivities? Is everyone expected to eat that diet? Doesn't sound bad to me. Kathy D, permit me to give you a quick overview. When Greece joined the E.U. in 1981 it was essentially a homogeneous land of less than ten million. With financial prosperity came Filipinos to serve in domestic jobs no longer done by Greeks and the fall of the Soviet Union in 1989 brought a wave of Eastern European immigrants seeking better lives, but it was after 2002 and the confluence of the euro currency launch, America’s wars in Iraq and Afghanistan, and Greece’s all-out building boom for the 2004 Athens Olympics, that the floodgates opened. Romanians, Bulgarians, Albanians, and Poles came to put their much needed construction skills to work for pay far greater than any they could dream of back home, and Greece’s porous island and mainland borders became an irresistible magnet for those fleeing Turkey, Iraq, Afghanistan, Pakistan, Bangladesh, and struggling Africa. A situation intensifying in recent years with Greece serving as a portal to the rest of the European Union. Greece’s population is now almost eleven and a half million, of which ten percent are estimated to be immigrants. Approximately 8,000 Greeks are Jews. 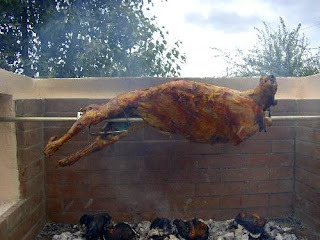 No one is required to join in the festivities or eat anything they don’t want, but it’s clearly a country heavily influenced by the Orthodox Church. Thanks for the quick overview. I do know about the recent migration situation and so was asking about the comment about the country being 98% Christian Orthodox. It seemed to me that people of other religions had migrated there. And I knew there were Jewish people in the Greek Resistance in WWII and also that the Nazis committed atrocities against them, as well as resisters and many other Greeks. Many of the immigrants since the fall of the Soviet Union were Christian Orthodox (though not Greek Orthodox), so the 98% figure seems accurate even though the total immigrant population is more likely 10%. Approximately 80,000 Jews lived in Greece (mainly Thessaloniki) pre-WWII. Only 8,000 now.